Ready to tackle game-day temptations? 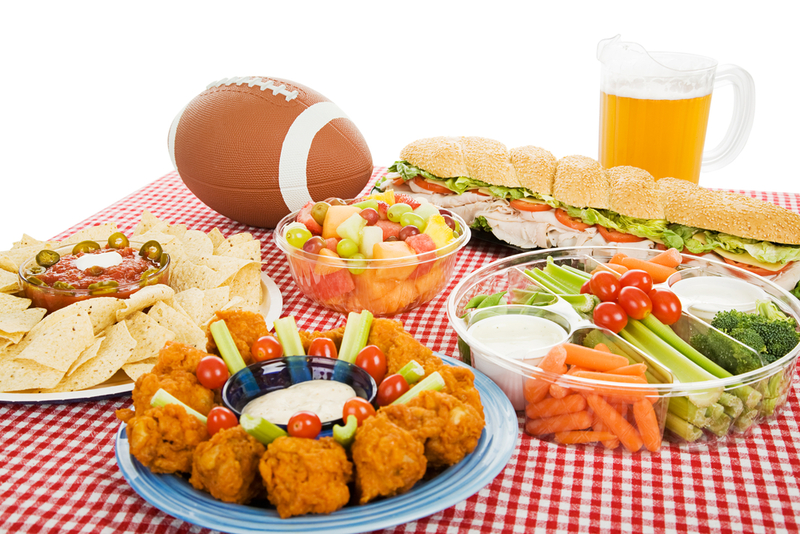 Whether you’re a serious football fan, or are just watching for the commercials and half-time show, one thing’s for sure: you’ll be surrounded by a plethora of fattening foods. If you’re watching your waistline, follow these 3 tips to help you walk away with a win…no matter which team you’re rooting for. Pregame (with food!) before the game. This way you won’t head to a party ravenous and pick at calorific appetizers and gorge on creamy dips all evening long. Your best bet is a light, but filling snack that combines protein, fiber and water – a combo of nutrients that work together to take the edge off your hunger and give you ammo to fight tasty temptations. Try ¼ cup of hummus (made with chickpeas—a good source of protein and fiber) with loads of your favorite crudités veggies (filled with fiber and water)—whether that’s baby carrots, sugar snap peas, cherry tomatoes, celery, or bell peppers. Anything goes! For every alcoholic beverage you drink, follow it up with a glass of water or seltzer to stay hydrated. If you drink more booze and get a little tipsy, you tend to lose your inhibitions and head straight for the junky food. When it comes to alcohol, stick with the lowest calorie options like light beer, wine, or your favorite spirit mixed with seltzer and a splash of juice. Bottoms up! 3. Give game-day classics a JOYful makeover. No need to give up creamy dips, spicy wings, and cheesy game-day treats. Instead, enjoy slimmed down versions of all the comfort foods you crave. Attention home chef hosts: Dig into some my these delicious dishes that won’t break the calorie bank: my Buffalo Chicken Dip, Sweet Potato Nachos, Spinach Artichoke Dip, Buffalo “Wings” with Blue Cheese Dip, Skinny 7 Layer Dip, Spinach Artichoke Dip and an indulgent Philly Cheesesteak. Whip up my lightened up renditions and you’ll score major points with the friends you’re hosting. Tasty Touchdowns for sure! For more healthy tips and delicious recipes, follow Joy on Twitter, Facebook and Instagram and check out her cookbook From Junk Food to Joy Food.